Tri-Heat Heating Pad – Free Shipping! It can transform into a flat heating pad for your back and other areas as well as the TRI-HEAT shape for your muscles and joints. It’s two heating pads in one! The Triangular shape provides heat therapy to two places at once. ETL Certified (comparable to UL Listing) heat source is water resistant and safe to use with our foam pad and water misting. 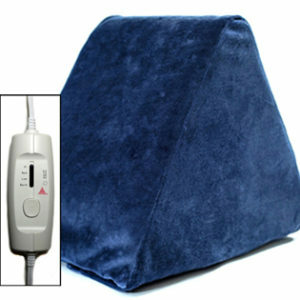 Push button temperature controller with large button, ideal for arthritis sufferers, features 4 heat settings. Free Shipping within the continental United States. Please contact us for shipping rates outside of the continental US.